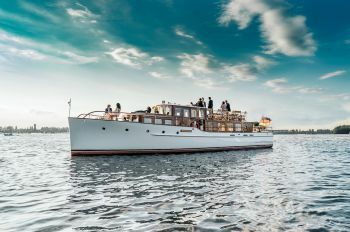 With the MOTORYACHT FITZGERALD and the BELLINI LIMOUSINE you can charter the most beautiful boats in Berlins’ waters. we are welcoming you on board. The 20s MOTORYACHT FITZGERALD offers space for up to 35 guests and the Venetian taxi limousine BELLINI accommodates up to 10 guests. You can rent our beautiful ships either hourly or for a whole day (8 hours). Our crew is already on board and will hand you a glass of champagne upon your arrival. Enjoy your exclusive sightseeing tour on a Spree or bridge tour as you listen to the guide and the wind blowing through your hair. On both ships you can choose both: pure sun or shadow places below deck or in the cabin. Celebrate the most beautiful day in life in a noble and exclusive way on the MOTORYACHT FITZGERALD. 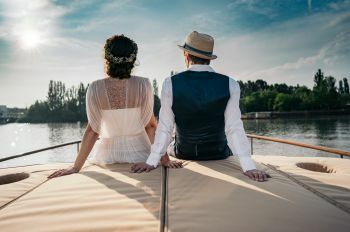 Your wedding celebration on the river Spree will be a unique and unforgettable moment, which you can immortalize with photos in the most beautiful settings. 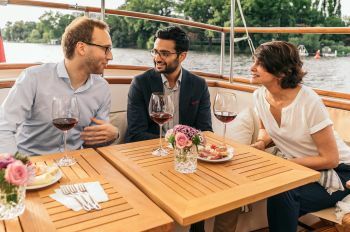 Your employees or customers will be delighted with your corporate event at SCHOENESCHIFFE.BERLIN. In a stylish atmosphere and with exquisite drinks, it is easier to confer and celebrate even better results. The two noble ships are waiting for you: the finest leather, the most beautiful mahogany, and stylish equipment. In addition, a crew that loves beautiful ships and cares for you and your guests. Whether a private party or company event - your event is in the best hands with us. We look forward to your inquiry. By phone: 030 - 554 994 60 or via our contact form.